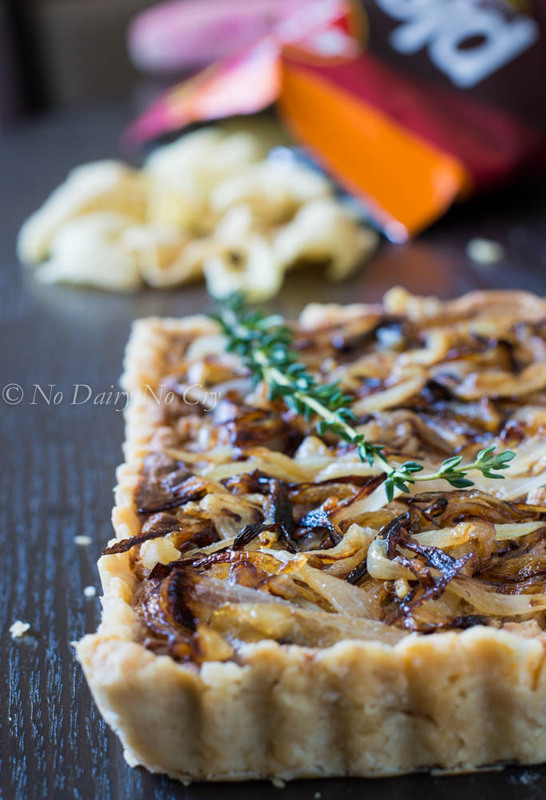 I have been wanting to make an onion tart for so long. The problem is no one really likes onions in this family except for me…I loooooooove them. I don’t know what it is about onions that have me obsessed. I mean I certainly don’t appreciate the tears that stream down my face every time I slice through one of them, and it doesn’t exactly smell good either; neither does your breath if you like biting into them raw (like I do with some of my foods – don’t judge.) I really like the crunch factor when they’re raw, plus I know how healthy they are for you, and when they’re cooked, they’re unbelievably delicious. When I make my roast chicken, I purposely cut up at least 4 large onions just so I can have more. I have issues. I love any challenge, but especially one that allows my creative side to come though. I thrive on it. When I read their challenge on Facebook, 3 dishes came to my head! I can’t wait to share the other two creations I came up with..you’re going to be blown away! It’s a dish you must make immediately. 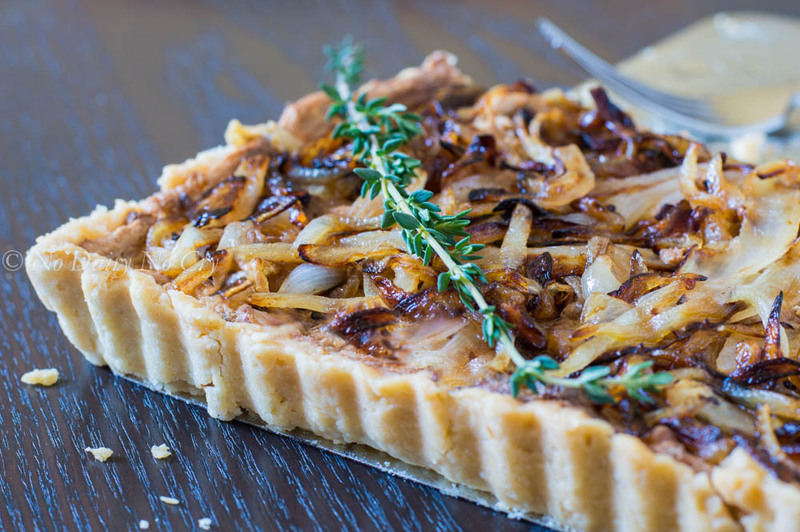 This tart is completely priority allergen free (Canada and U.S.). I normally don’t bake with gluten-free flour, but since Enjoy Life is an allergen friendly company, I felt it only made sense to make the crust allergen friendly as well. I’ve also made it where I caramelized only half the batch of onions; cooked the raw onions in the filling, and caramelized the other half. And the other way where I had caramelized the entire batch of onions, and placed half into the filling at the end. The first version lent a much sweeter – almost dessert like – taste, while the other version tasted more earthy and savoury. Both were equally delicious so I’ll leave that up to you to decide. Because I shot the video, I don’t have as many detailed progress pics as usual. So be sure to check out the video on my social media pages here and here for the how-to! Without further ado, I give you the recipe for this amazing tart. Free from: dairy, egg, peanut, tree nuts, soy, wheat, gluten, fish, shellfish, mustard, sesame, animal product, animal by-product. 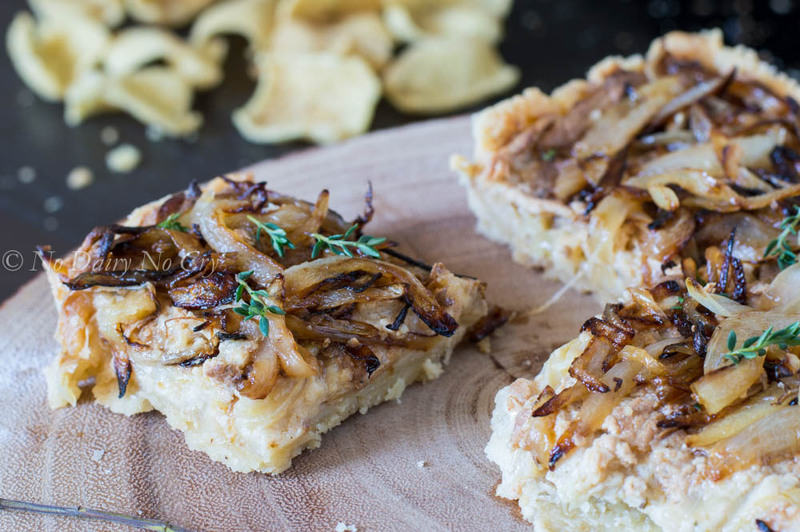 A delicious sweet onion tart that takes a twist with the addition of Plentils Margherita Pizza lentil chips. 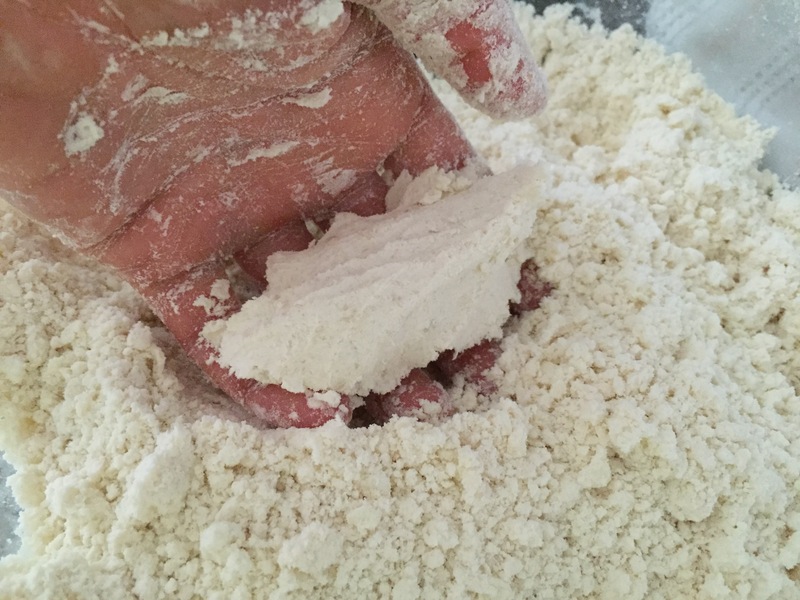 In a large bowl, mix flour and salt. Add cut or dollops of shortening and butter and using a pastry cutter, work the ingredients just enough that butter/shortening is incorporated. Make sure you don't over work the fats into the flour. The bigger the pieces of fat, the better. Next, add 4 tablespoons of ice water and using a spatula or wooden spoon, mix with the flour. Continue adding water a tablespoon at a time until you're able to make a ball of dough when squeezed. The less the water, the better. It's ok if it's a bit crumbly, the fat will take care of that. Cut onions in a thin uniform fashion, I highly recommend using a mandolin for this (if available), and sauté in a pan with the oil, on medium high heat, until caramelized. Set aside. Next, combine mayonnaise and shredded cheese. Add the rest of the ingredients, reserving the garlic for last. Add about 1/2 of the caramelized onions into the filling and stir until combined. Remove chilled pie dough from the fridge and place on a clean work surface. Keep the plastic wrap at the bottom of the dough and place another equal sized plastic wrap on top of dough. 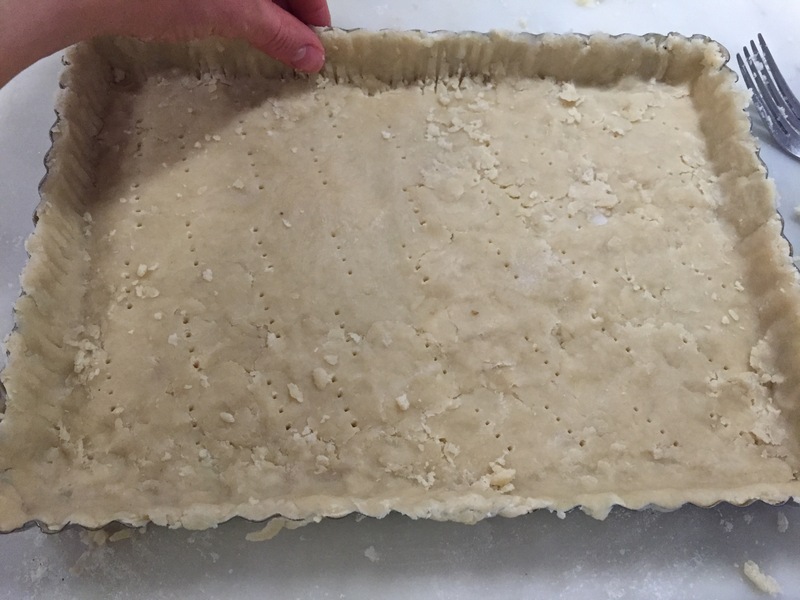 Using a rolling pin, gently massage the dough and flatten. Next, and this is important, using either a pizza lifter, flat plate, or a cookie sheet (with no edges), gently slide the dough with the bottom plastic wrap, move it to the tart pan, and gently pull the plastic wrap at the tip of the dough, towards you, which will cause the dough to effortlessly slide into the pan. Then, add filling and top with remaining half of the caramelized onions. Top with fresh thyme. Place in preheated oven and bake tart for 25-30 minutes, until crust is a beautiful golden colour. This pie dough and filling recipe will yield exactly enough for an 11x14" tart pan. If you have a food processor (I don't), use that instead of the fork/pastry blender. Pulse dough and fats until just incorporated. Don't overwork it! 1. 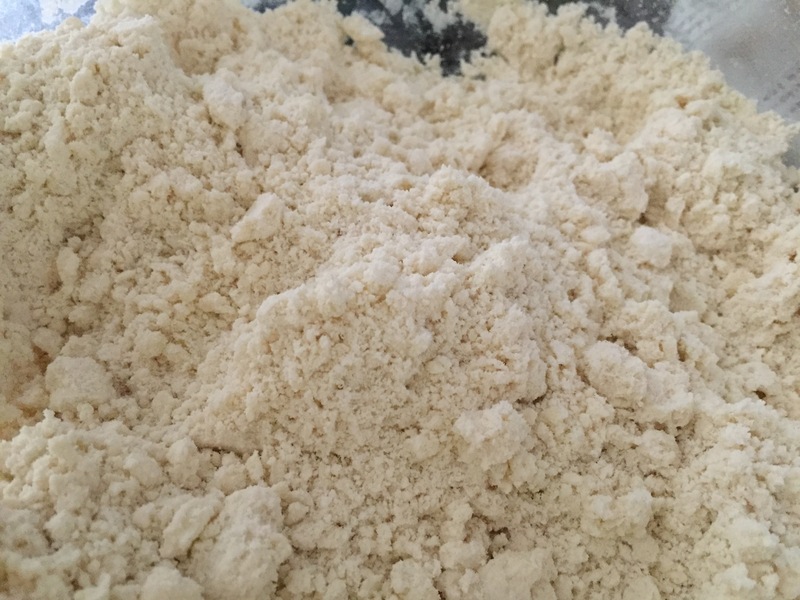 In a large bowl, mix flour and salt. Add cut or dollops of shortening and butter and using a pastry cutter, work the ingredients just enough that butter/shortening is incorporated. Make sure you don’t over work the fats into the flour. The bigger the pieces of fat, the better. 2. Next, add 4 tablespoons of ice water and using a spatula or wooden spoon, mix with the flour. Continue adding water a tablespoon at a time until you’re able to make a ball of dough when squeezed. The less the water, the better. It’s ok if it’s a bit crumbly, the fat will take care of that. 5. Cut onions in a thin uniform fashion, I highly recommend using a mandolin for this (if available), and sauté in a pan with the oil, on medium high heat, until caramelized. Set aside. 6. Next, combine mayo and shredded cheese. Add the rest of the ingredients, reserving the garlic for last. 7. Add about 1/2 of the caramelized onions into the filling and stir until combined. 8. Remove chilled pie dough from the fridge and place on a clean work surface. 9. 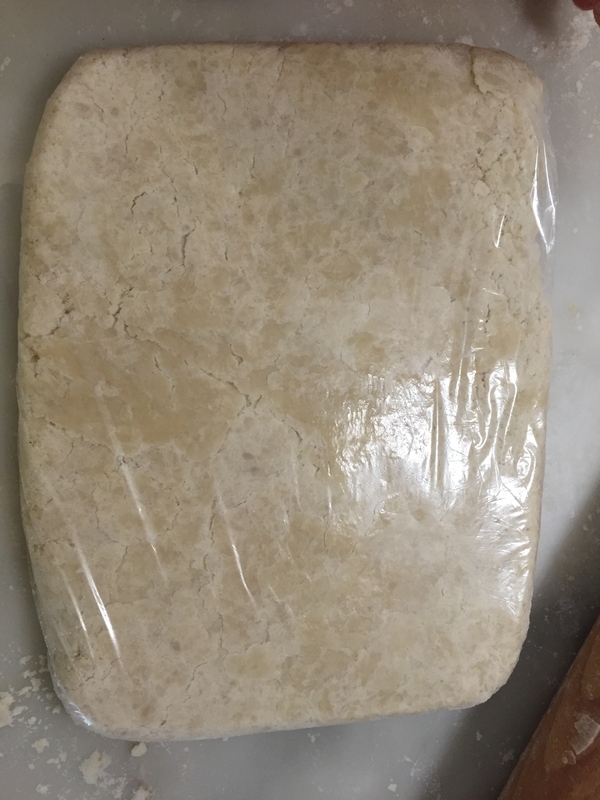 Keep the plastic wrap at the bottom of the dough and place another equal sized plastic wrap on top of dough. 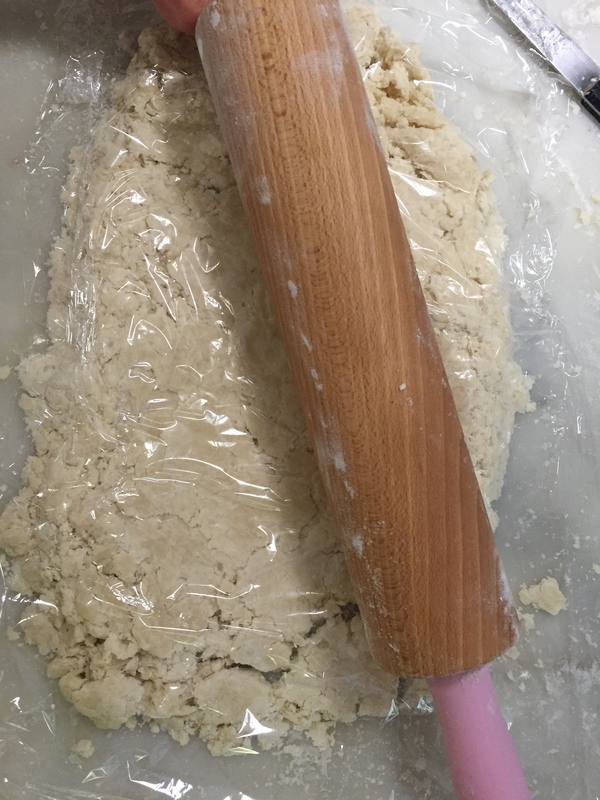 Using a rolling pin, gently massage the dough and flatten. 10. Next, and this is important, using either a pizza lifter, flat plate, or a cookie sheet (with no edges), gently slide the dough with the bottom plastic wrap, move it to the tart pan, and gently pull the plastic wrap at the tip of the dough, towards you, which will cause the dough to effortlessly slide into the pan. If there’s breakage, simply mend the dough using leftover dough pieces on your work surface. Working quickly, shape the dough to your desired pan. Poke holes through the bottom using a fork. 11. Then, add filling and top with remaining half of the caramelized onions. Top with fresh thyme. 12. Place in preheated oven and bake tart for 25-30 minutes, until crust is a beautiful golden colour. 13. Remove, let cool slightly before removing from pan, or serve in the pan too (if your pan doesn’t have a removable bottom).